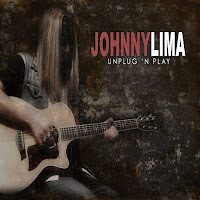 Rock & Metal 4 You: CD-Review: Johnny Lima - "Unplug 'n Play"
Californian Rocker Johnny Lima seems to be more active in recent years. Since 2012 he is touring around the globe, playing shows in America, UK, Sweden, Germany and more. In 2014 his latest record "My Revolution" came out and was one of the best Melodic Hard Rock records of that year. What came next? Some more shows in Northern Europe, but this time with an acoustic set. Maybe that was the reason for Mr. Lima to record a full acoustic album. Before you start to complain now about "boring" unplugged stuff you should read the following lines. I can understand if people don't like unplugged albums. Often they are just there to fill the gap until a new album comes out and often the songs on those albums are just warmed-up acoustic versions of already existing songs. Not so on Lima's "Unplug 'n Play"! For this album Johnny Lima wrote ten brand new (!) tracks and recorded them in a semi-acoustic way. That means bass and drums are still present and give those songs some more rhythm. It would have been so easy just to put old songs on this album, but you won't find one old tune on here. This is something that has to be honored! The songs are all very enjoyable and have a focus on guitar- and vocal harmonies, which makes this album sound more like singer/songwriter stuff than the traditional Arena Rock Johnny Lima is known for. Yes of course this is a more slow record and personally I also think there are a bit too many ballads on here, but such songs are predestined to put them into an acoustic arrangement. Nevertheless Johnny tries to keep everything a bit more varied with some unplugged rockers like "I'm So Excited", "Hallelujah" or the earworms "Let It Shine" and "I Got The Girl". Those are also the tracks where this albums shines the most. Also the ballads are beautiful to hear if you like this kind of stuff. Johnny put once more so much passion and love into his music that also the slower songs like "Still Doing Nothing At All" and "I Do" are worth listening to, especially now around Christmas time this is simply beautiful and atmospheric. With that said Johnny Lima delivers also perfect vocal performances here, the production is crystal clear and of course Mr. Lima played every instrument on his own. Thumbs up to this full-blooded musician. To get straight to the point: if you are a sucker for acoustic guitars and you can also sink into some more softer tones you'll love this album. It creates some very thoughtful moments with it's beautiful harmonies and shows Johnny Lima from a different, more mature side. Make yourself a Christmas gift and order "Unplug 'n Play" on Johnny Lima's Homepage. It's worth every Penny!